The science dictated complexity of fine ingredients give the impression of grandeur while its sublime shine turns into real beauty in the young and the not so young as acne and age spots vanish. When I formulated the very first StemDetox nine years ago, I was involved with stem cell research. While everybody came out with new stem cell boosting supplements, I took a different path. Order a StemDetox and you could get a FREE Potassium Iodide bottle. Use coupon code ‘northkorea’ at checkout to get it for free. I thought that instead of forcing the bone barrow to produce more stem cells, it should be rather detoxified to unleash its true potential in regeneration and immune boosting. My novel approach, the detoxification of the bone marrow with StemDetox, was embraced widely as it was proven that StemDetox delivers where others fail. When tested, my stem cell count in my blood went up by 82% over 10 days as I took StemDetox daily. Stem cell enhancing supplements are typically tested 2 to 10 hours after taking the products (e.g. StemEnhance yields a 23% stem cell increase in about 3 hours). But I don’t appreciate those measurements as it seems that stem enhancing products just help the ‘detachment’ of stem cells from the bone marrow that are just about to be released into the blood stream. I believe that instead of a quick stem cell spike right after taking a product, the goal should be a sustained elevation of healthier stem cells (with long telomeres) days and months after a product is taken. This can be achieved only by the detoxification of the bone marrow and by having high glutathione levels. Glutathione regulates telomerase enzyme activity that in turn ensures normal telomere length. More importantly, I’m convinced by now that the combined effects of StemDetox, ToxDetox (Glutathione and EDTA) and StopReabsorb/Charcoal result in the most desired, balanced and detoxified body that can maintain high level of circulating stem cells with long telomeres. And this is the ultimate goal. (One of my favorite studies was done with rats. The group of rats, taking charcoal every day, achieved a 40% longer, healthier life-spam. Simply amazing!). I researched organ preservation and longevity at the University of Toronto and I constantly review the medical literature. I haven’t found yet anything better than StemDetox/ToxDetox combo. While others occasionally hit a high note with a newly discovered, single ingredient, I fully stand behind my novel approach to wellness and anti-aging that I compare to a well-rested (and well fed) orchestra when the musicians understand their role in the expression of the joy of life as they play in glorious harmony in a most beautiful setting. Here are some of the unique features and stories associated with StemDetox. Peter Fraser, the co-founder of NES Health (Nutri-Energetics Systems) had the ability to test thousands of nutraceuticals. Peter claimed that StemDetox is the best one and he took it regularly. George Gillson, MD, PhD, Founder and Medical Director of Rocky Mountain Analytical run a pilot study with StemDetox when 36 urine samples were analyzed. It was confirmed that StemDetox do help with the detoxification of toxic heavy metals, such as lead, mercury and others, but of course, not on the high level ToxDetox is able to accomplish this. StemDetox was taken by members of the Hungarian Olympic Team and those swimmers who took it noted its performance enhancing effects. There were no problems with the all-natural ingredients, yet, StemDetox was put on the banned list of nutritional supplements. I assume that some of the competition didn’t want to take StemDetox before the qualifying competitions and rather blocked it. Anyhow, the experience opens up new opportunities in competition sports. I would be open to help a sport team where it is easy to measure the difference, such as in swimming, maybe by running a pilot study. Skin improves (acne and ‘age spots’). Teenagers take StemDetox for getting rid of their acne (over 80% of them have acne). Age spots reflect on the inner environment. It was truly unintended, but now StemDetox is embraced by the young, the not so young and even those who have psoriasis and aging skin. We have no explanation why women report that their breast lumps disappear after taking StemDetox. It would be great to run a study. Enlarged prostate, the disrupted nights as the urgency to go to the bathroom becomes too much and the reduced energy is all familiar to many. StemDetox was the only product taken by many men who reported great improvements. Again, we have no clear explanation why StemDetox would be such a formidable supplement. Questions about hormone levels are important as we age (hormone replacement, menopause). While it is suggested for women and men to take extra hormones, mainstream medicine is quite about a better approach, let’s detoxify the whole body to give a new chance for organs and cells to function better. Today infants are born carrying hundreds of toxins and due to the bioaccumulation of toxins over a life-time, many of these toxins multiply and stored in fat and bones turning us into depressed, low-energy individuals, stealing our inner balance. Even the endocrine-disruptor (xenoestrogen) BPA (bisphenol-A) was measured in the umbilical cord of the newly born. A study reported that Chinese workers exposed to BPA experienced erectile dysfunction and other sexual problems. No wonder we become sick and tired with low libido by middle-age. 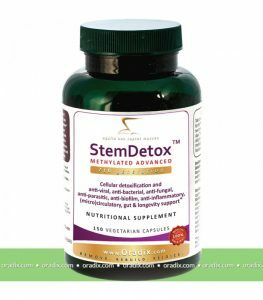 Likely, StemDetox helps so much in hormone related issues since only a detoxified endocrine system can work on its peak. However, StemDetox in combination of Glutathione 1.5 (glutathione removes BPA and other toxins) is an even better idea for graceful aging. 1) Gonullu H, Gonullu E, Karadas S, Arslan M, Kalemci O, Aycan A, Sayin R, Demir H. The levels of trace elements and heavy metals in patients with acute migraine headache. J Pak Med Assoc. 2015 Jul;65(7):694-7. This entry was posted in Health News and tagged anti-aging, anti-biofilm, detoxification, stem cell.